One of the elements of any NRICH CPD session is a discussion about rich tasks - after all, our website home page welcomes you to 'the home of rich mathematics'. Another phrase that frequently crops up is 'low threshold high ceiling tasks'. So are they the same? If not, how are they different? Let's tackle low threshold high ceiling (LTHC) first. The phrase conjures up a picture of a doorway with a low step into it. LTHC tasks have very easy access - they are suitable for practically anybody to have a go. Step into the room, have a good look around and explore. There may be some walls preventing you from moving too far left or right or straight ahead, but what about upwards? That ceiling is a very long way off! You'll have to do some climbing! LTHC tasks have easy access but lots of potential for those who feel brave to climb up to the same kind of, but more sophisticated, mathematics. 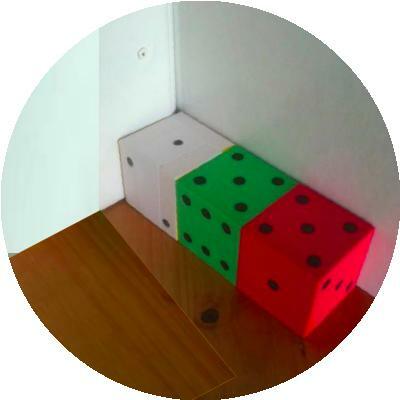 There are three dice sitting in the corner with the simple rule that where two dice meet there must be the same numbers facing each other. 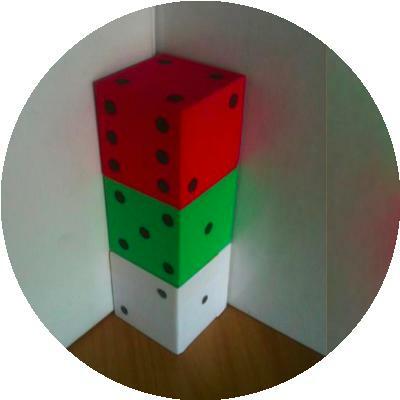 Your challenge is to arrange dice (using at least $2$ and up to as many as you like) in a line from the corner, so as the faces you can see add up to $18$ (instead of the $21$ and $23$ above), in as many ways as possible. 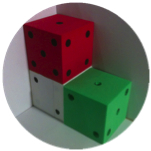 Dice in a Corner is a good example of a LTHC task for the primary classroom. Because it is easily accessible you can use it with the whole class at the same time. If you're familiar with this task, read on. If not, take a few moments to play around with the ideas. It's LTHC because the entry point is very low and only requires following instructions about the positioning of the dice, and addition of five or more single digit numbers. It's LTHC because the next step is exploration with lots of choices - so less confident children may work with just two dice whilst others may use three or more. It's LTHC because some children will work randomly, others through trial and improvement, whilst the more sophisticated thinkers will be noting patterns and devising a strategy. The challenge then brings the results of all that investigating together. The task is also LTHC because children will use different ways to record their results. Some children need to be challenged to record using pen and paper whilst others can use photographs to record their working. If you look at the solutions sent in you can see variations on this. And finally it's LTHC because of the different levels of explanation and justification that it can elicit. By comparison, rich tasks conjure up a different picture. Here the experience may be of stepping in through a very small door and then finding yourself in a corridor with many alternative paths from which to choose. You may discover some surprises along your chosen route, or catch a glimpse around a corner of something which intrigues you. You may discover that some paths take you into different rooms altogether. Rich tasks often have a definite starting point but a choice of lots of possible routes through to different end points. An example of a rich task for primary classrooms is Got It. If you're familiar with this task, read on. If not, take a few moments to play around with the ideas. Got It is rich because it starts from a relatively closed challenge - can you get to 23? - but then offers lots of other routes. It's a rich task because it combines fluency and mathematical reasoning - fluency in terms of addition and subtraction, reasoning in working backwards and making conjectures about what will or won't work. It's rich because children find it an intriguing context. It's rich because it allows children to invent their own questions which arise naturally out of the investigation - 'what if the target number was different? '; 'does it matter who goes first?'. It's rich because it encourages collaboration and discussion - as most games do. It's rich because it supports different approaches and different responses. Some children will enjoy playing the game lots of times and seeing if they can pattern spot. Some will work systematically using smaller numbers and work up to the challenge of 23. It's rich because working on it reveals patterns and generalisations (which numbers are 'good' numbers to land on if you want to win - why?). Well, in this country, and perhaps in yours, lots of young folk are wearing bracelets - both girls and boys. I was looking at some that my students wear and found that some were magnetic! Many seem to have beads that are spherical and they go around the wrist quite comfortably. There are lots of different sizes and some have large beads and some quite small beads. I suppose that most wrists are kind of oval - squashed circles - in shape and with the string or wire through the beads they fit very well. It was playing with the magnetic beads off the person's wrist that gave me some ideas. There were $18$ beads altogether and they were all the same colour but I've chosen to show them in a variety of colours! mind you, you'd have to have a triangular wrist for them to stay like that! Now suppose we play around with this idea and make a rule that there has to be some shaped hole in the middle for a wrist. But we'll allow that to be all kinds of shapes :- vaguely triangular, rectangular, hexagonal etc. You could try this out with marbles, circular counters, tiddly-winks, coins or with a drawing program on your computer. I think we'll make a rule that the circles/spheres have to be the same size and you don't have to imagine that they're magnetic! I like the next one - although it was a little hard to do on the computer! Have a go at making these with your circles! Well, now it's time to explore, to see what other bracelets you can make. Remember that there's to be a "wrist-hole". The shapes should be kind of "regular" but not strictly so, because then we could not use rectangles. If you make a particular shape with $18$ and then the next size up comes when you use $24$, is there going to be the next size up at $30$? What will the next size up of this look like? What are good numbers of beads to use? Why? What's the smallest number of beads that will allow you to make two identical bracelets? Why? How many will you need to make three of those? Would cube beads lend themselves to exploring slightly differently? What about tetrahedral beads? Of course there are some excellent, very useful tasks which are both LTHC and rich - have a look at Bracelets for example. It's accessible to pretty well everyone but offers possibilities to progress in exploring number patterns, from simple to much more complicated. It's an intriguing context and allows children to invent their own questions, find their own routes through it, and make connections and generalisations too. Are you tempted? If you feel you need an excuse, both these kinds of tasks are ideal as formative assessment opportunities. You will find out so much more than you expected by observing children's reactions to LTHC and rich tasks. You can read more about rich tasks here, and low threshold high ceiling here.